Tropical trees are increasingly seen as a valuable renewable natural resource. They maintain and improve soil fertility, and provide protection from sun, wind and heavy raindrops. Trees also yield a great range of important products, play a crucial role in many farming systems, and form the base of the food-chain for numerous animals. Their presence is clearly essential for the survival of people in the tropics. Despite these many vital roles, tropical trees continue to disappear about ten times faster than they are replaced, which threatens the life-support systems of many human communities. Yet the forests and savannas, farmland and woodlands where they thrive could be managed sustainably, providing soil protection, supplies of products and other benefits in perpetuity. Tropical Trees: Propagation and Planting Manuals provide practical, illustrated guide-lines, based on general scientific understanding and local experience. The main aim is to encourage the growing, planting and care of trees on any site, by anyone, at any scale. The series covers all stages from genetic selection through setting up a tree nursery to planting and successful establishment in the field (see inside back cover). Also included are sources of further information and examples of check-lists, record sheets and worked examples of calculations. The Manuals are spiral bound so that pages can easily be photocopied for use in the field. We hope that the series will stimulate translations into other languages and the writing of sheets specifically for local use. 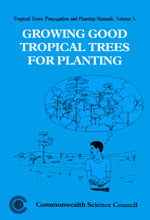 This is the third volume in the series: Tropical Trees: Propagation and Planting Manuals. It deals with a vital stage in the increasingly urgent work of replanting trees in the tropics - growing good planting stock. 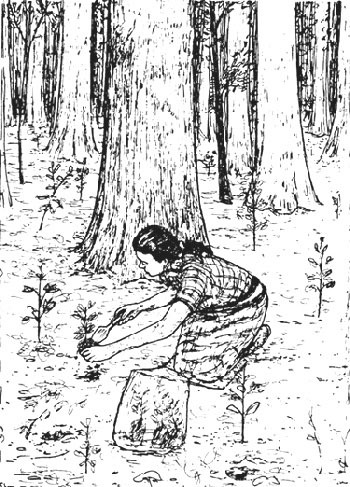 The first two volumes are concerned with propagation by rooting cuttings and by germinating seedlings, while this one is about the planning and running of a successful tree nursery. Whether one is growing a few plants in a temporary site, or many thousands in a permanent nursery, the growing conditions affect the numbers, quality and size of the young trees, and when they will be ready to go out. One of the keys to whether they will survive and grow well after planting is the type of root system produced in the container or nursery bed. Others are proper nursery handling, protection and care, particularly at critical stages. Trees have existed within and recolonised tropical farmland for many centuries, and so it might seem that there would be no need for manuals. On the contrary, precisely because many species were once self-replenishing, there is usually little or no experience of propagating them. At the same time, there are large areas of bare, degraded land in the tropics, without enough parent trees to provide seed for natural regeneration or for planting. Another reason is that running a tree nursery is one of those apparently straightforward undertakings in which any one of a range of problems and difficulties could arise. Unsatisfactory planting stock is frequent, and poor growth and failure to survive can occur because a single point has been missed in a well-run nursery. Manuals are also needed because less experimental research has been done on tropical trees, compared for instance with some of the main cereal crops, and much of it is scattered and unavailable to the grower. As a result, there is a lack of underpinning of nursery practice with theoretical understanding of tree growth, particularly in physiology, microbiology and genetics. The results of practical trials may also be unknown outside the country where they were carried out. Yet a great diversity of what are effectively still ‘wild’ tree species need to be grown for planting on a wide range of different sites by a variety of people. In these circumstances, explanations of relevant information and experience are clearly necessary, put in the form of practical procedures and advice. In this Manual, planning, setting up and running a tree nursery are covered in detail, with emphasis on the points to look out for in each procedure. As a basis for this, the general principles of tree growth are outlined in non-technical language. What cells are and how roots, stems, leaves and branches grow are explained, together with the maintaining of the tree's water balance, the absorption of nutrients, and the production and movement of substances. As in the other manuals, there are several sheets on experimental research, including the setting up, assessment and analysis of experiments with young trees in pots. Only 25 years ago, it was thought that tropical trees had few mycorrhizal associations; nowadays it is recognised that these are very widespread, playing vital roles in the nutrition and probably the water relations of most trees. The effective recycling of nutrients in agroforestry and other woodland ecosystems depends greatly on mycorrhizas and nitrogen-fixing nodules, and it is likely that inoculation in the nursery would save on costly fertilisers and benefit field establishment in many more tree species than the few so far studied. Genetics has progressed only as far as provenance testing in some of the commonly planted tree species, but is clearly of much wider importance than this. Because the need for more trees is so urgent, it would be a great pity (though understandable) if it was assumed that plants of any origin will do. In fact, since most trees are ‘undomesticated’, the potential for large genetic gains is far greater than for crop varieties that are already highly-bred. Indeed, some of these can lack the broad tolerance of extreme conditions built into older, traditional mixtures of agricultural strains. In both cases, genetic diversity clearly needs to be conserved, but for trees this should go hand-in-hand with domestication, which can be hastened by alternative propagation techniques. Then superior sets of genes will be retained and passed on, both in current planting and each time regeneration occurs in the future. Sadly, many of those who recognise how important trees are, and would like to replant them within local landscapes where they are badly needed, lack both money and technical advice. Yet simple hints, cheap methods and additional species are now available, so that most problems can be foreseen or overcome. Readers are encouraged to look for ways of spreading the information in this manual to such potential growers, including the photocopying of relevant sheets, and their translation into other languages. It is also hoped that the manuals will stimulate the writing of sheets on individual tree species or particular regions. Acknowledgements are made for the use of photographs and diagrams as a basis for some of the drawings in this Manual, including several from Fuller (1983), Goor and Barney (1968), Mung'ala et al. (1988), Napier and Robbins (1989), and Shanks and Carter (1994) - see sheet C 61-A, D. I should like to thank many colleagues, in the tropics and in Europe, for their help and stimulation. Suggestions from readers for additions and improvements, and ideas for Volumes 2 and 5, would be welcome. The author, Dr Alan Longman, has worked in the West African tropics for 9 years, teaching plant physiology, doing research on trees and planning and developing a large tree nursery for vegetative propagation. He has taught and supervised students at all levels, and his research into the growth and development of trees included studies of flowering and phase-change, rooting of cuttings and early genetic selection, and the effects of day-length and temperature on shoot growth and bud dormancy. Starting as a forestry worker in 1949, Dr Longman has been a Senior Lecturer in the University of Ghana, Principal Tree Physiologist of the U.K. Forestry Commission and a Charles Bullard Fellow at Harvard University. He began a research project on tropical trees at the Institute of Terrestrial Ecology near Edinburgh, Scotland, which has now been running for almost 25 years, with linked projects in several tropical countries. He is on the Editorial Board of Biologia Plantarum, reviews scientific papers and books, and is an Honorary Fellow of the University of Edinburgh. In retirement, Dr Longman is writing the five Manuals in this series, and he also wrote the scripts on which the video accompanying Manual 1 was based (see inside back cover). Plans for the future include four more videos to accompany Manuals 2 to 5.